Disclosure: The Lapdogs are Chewy Influencers and received a case of Wellness CORE Simply Shreds, free of charge, in exchange for spreading the word about the product and Chewy. We only share information that we feel is relevant to our readers. All opinions expressed are our own. I've been adding a topper to the Lapdogs' dinner since before the term "food topper" was trendy. My go-tos include canned food, vegetables, sardines, pasta, fruit, dog-friendly leftovers, eggs, etc. While I try to rotate things, giving my dogs a variety of added nutrients, as well as flavors and textures, I do get stuck in a rut from time to time and find myself using the same thing again and again. 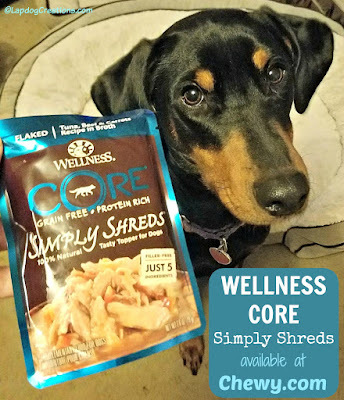 So when our friends at Chewy asked if we'd like to try Wellness CORE Simply Shreds, I immediately said yes. High quality wet food is one of the easiest toppers to add, and I'm always looking to expand our pantry staples. The first thing that stood out about Wellness CORE Simply Shreds is the fact that it is limited ingredient. In fact, there are just 5 ingredients per recipe! Having three dogs with three different sets of dietary restrictions, limited ingredient recipes are very important. Plus, no body wants unnecessary additives or fillers, right? Simply Shreds have been formulated to provide our dogs with a wholesome, meat-based ancestral diet that they not only crave, but will thrive on. The 100% natural, grain-free, protein-rich recipes will leave your dog begging for more. We chose to taste test the Grain-Free Tuna, Beef & Carrots recipe. As mentioned, there are just 5 ingredients - tuna, beef, carrots, fish broth, and pure water - packed into each 2.8 oz pouch... and those 5 simple ingredients had the Lapdogs drooling as soon as I tore open the first pouch. It smells like the best human-grade tuna money can buy, and of course this klutzy dog Mom managed to spill a good amount of it upon opening. Which brings me to a friendly little warning... open those pouches slowly! There is a lot of gravy and deliciousness packed into each one, and it will squirt out if you aren't paying attention when opening. And, if it happens to land on say, your clothing... well consider yourself warned. 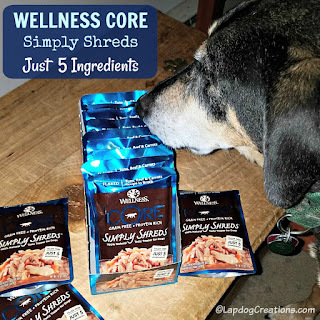 The Lapdogs give Wellness CORE Simply Shreds all paws up - and so does their picky Mom! They seem to think it's a special reward or treat, and I love that it's a high-quality, protein-packed, limited ingredient recipe that I feel great about giving to them. Simply Shreds will certainly be staying in our regular topper rotation! You can order a case of Simply Shreds at Chewy where 1-2 day shipping is always free on orders over $49! I will for sure let my friends who have dogs know about this. We dont have one currently! These food toppers are a great idea! My boyfriend puts things on top of his dog's dry food EVERY night. It's something I've never seen someone do before. 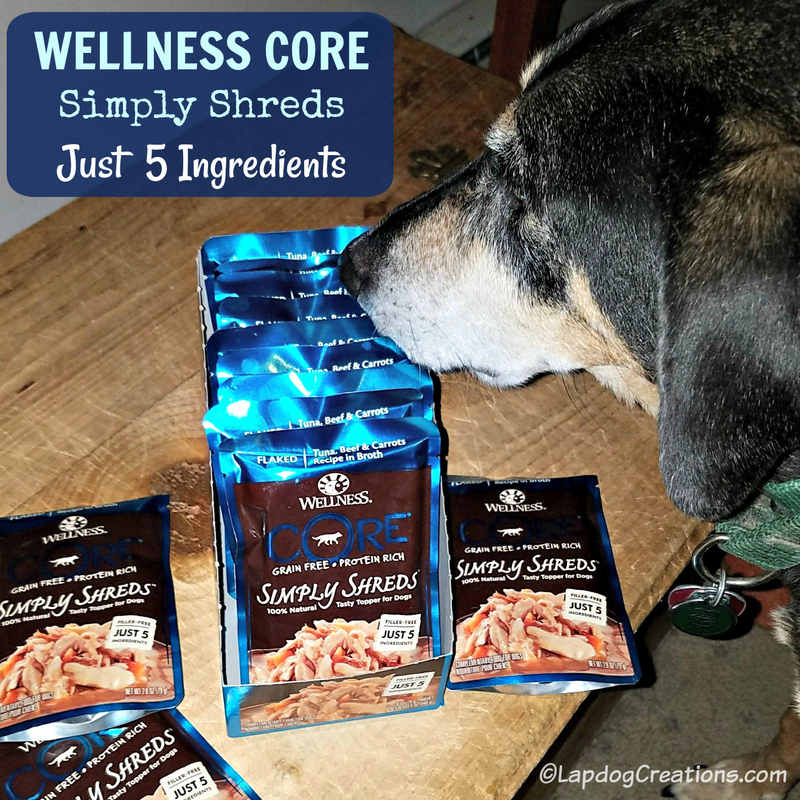 I love that there's actually a product from Wellness Core that is made for dogs to do this with their food. I know I will have to grab some for Zebo doggy! Oh wow, these look like a great option! Limited ingredients are really important for my little allergy prone dog. I bet the dogs love them. We have a pooch. And she of course loves treats - will have to see if she likes these! Awww what an adorable dog. Those treats look like something my dogs would love! This seems like a great product! I bet our dog, Odin, would love these... I wish we could find something similar here in Norway. My parents and my in laws have a dog each, so I will have to tell them about this! I know they will appreciate it. I think our dog would really like this. I love making sure that our dog is following a nutritious and healthy diet. Everyone in the family needs a meal to look forward to! These toppers sound like a great addition that I’m sure my pups will gobble up.